Punta Gorda is a fabulous place to visit. Nestled on the shores of beautiful Charlotte Harbor, it is the ideal place to spend a few hours, a full day, a few days or your entire vacation. Punta Gorda – it’s happening on the harbor. This page is designed to give you some fun things to plan, ahead of your trip to this jewel of Southwest Florida. We do however hope that you might stay longer and enjoy the great resorts and hotels that have sprung up all over our city in recent years. Any trip to this quaint and beautiful location has to start in either downtown Historic Punta Gorda or Fishermen’s Village. The two locations are only a mile apart, so you can enjoy both in half a day. Downtown’s unique old-Florida architecture is what draws most visitors to its quaint, cobbled streets. Once you get here, you soon realize that there is a myriad of unique shops and restaurants to visit. Nestled between Retta Esplanade to the North (our waterfront roadway) and Virginia Ave to the South, and between US41 South on the West to Wood Street on the East, the downtown area is undergoing a revitalization, following the catastrophic hurricane of 2004. Many of the old buildings have survived and are being restored to their former glory, to accommodate art galleries, boutiques and restaurants. Mixed in with the old are new developments, which have started to spring up around the downtown area. These buildings have been carefully constructed to strict guidelines, which the residents of Punta Gorda agreed to, to maintain the individual beauty of its downtown historical district. Look for the beautiful murals that have been painstakingly drawn on the sides of many of our downtown buildings. 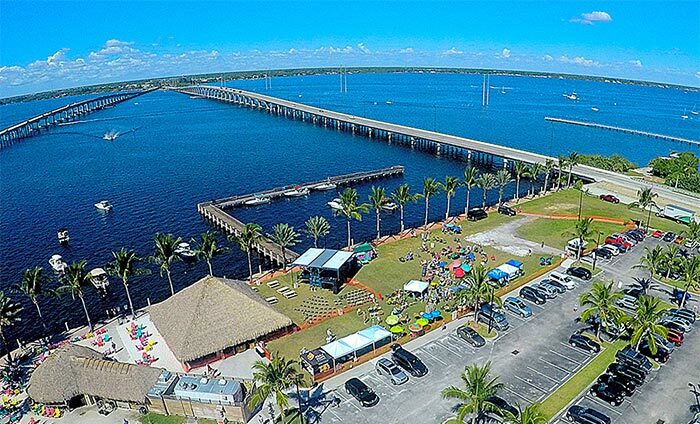 Make sure you make the time to view the waterfront and visit the many museums and parks that Punta Gorda boasts. Punta Gorda is a walk-able city – it is easily navigated, so find a parking space and just meander through the streets, basking in Florida sunshine. Remember that every 3rd Thursday of the month, the Downtown Merchants presents Wine Walk. Starting around 4pm and lasting several hours, the merchants open their doors and offer entertainment and refreshments as you stroll through the streets of the historical downtown area. Walking maps of Wine Walk are available from the Chamber office or from the participating downtown merchants. Don’t miss it – it’s great fun! The Punta Gorda Chamber office is clearly signposted from all entrances into the city – we are located at the corner of Marion Avenue and Sullivan – look for the two Chamber flags at the door! A short drive from downtown on Marion Avenue (westbound) will bring you to Fishermen’s Village – a fully-restored waterfront mall and marina. You will find exclusive boutiques, shops and fine restaurants, offering great views over the harbor. There is also daily nightlife with something different happening every day. From Fishermen’s Village you can enjoy sight-seeing cruises, go fishing, hire your own boat to explore the harbor or go jet-skiing. PGChamber_MindiAbair2019Promo from Harmonic Image Media Group Inc. on Vimeo. Don’t forget there is much more to Punta Gorda than just these two areas. There’s the Visual Arts Center, the Parks, the varied and exciting retail developments along both sides of US41, spas, fitness centers, professional offices, the numerous cycle treks around this cycle-friendly city, the Military Heritage Museum, Muscle Car City, the Pottery Express/Bamboo Farm in South Punta Gorda and our amazing waterfront. Here in Punta Gorda, you’ll enjoy some of the best sunsets that Florida has to offer, along with a diversity of places of interest to visit and shop in. Our real-estate market is vibrant and there are numerous realtors here in the Chamber that will be only too happy to show you around to see some of the most beautiful Florida homes imaginable. Our restaurants offer a wide variety of differing cuisines and cater to every palate and price point. We also play host to the Peace River Wildlife Center, located at the very western end of Marion Avenue, in Ponce de Leon park. Here you will enjoy up close and personal encounters with native wildlife that are being rehabilitated after suffering injury. It is a perfect spot to meander and enjoy learning about local bird species. There is also the Charlotte Harbor Environmental Center (CHEC) located at 10941 Burnt Store Road, where you can walk trails and enjoy a true “back to nature” experience. If you have more time to spare………………Come and stay with us for a few days. We are currently in the process of developing new lodgings but we already have hotels, motels, bed and breakfasts, waterfront villas and holiday rental specialists here in the City. Relax and enjoy the Florida lifestyle, away from the hustle and bustle of big city life. Enjoy the wildlife and the fishing. We welcome guests from around the world. We are known as a destination for people in New York, Illinois and Michigan, during winter months, but over the last few years, our guests have been staying longer and we now have a large amount of year-round visitors, with an increasing number coming from Canada and Europe. View the electronic version of our visitor’s guide here. Punta Gorda is the place to enjoy the Florida sun, without meeting the crowds on the beach. Strolling the waterfront of Punta Gorda is a favorite pastime, taking in the original homes still nestled on quaint streets. Drop by the Charlotte Harbor Environmental Center on Burnt Store Road and hopefully you’ll be able to view the nesting pair of bald eagles that have set up their home there. After that, drive out to the Babcock Ranch and Wildlife Park – one of the largest undeveloped expanses of pine flatwoods in Southwest Florida and a favored spot for horseback riding and pure nature enthusiasts. This is an ideal spot to view your first alligator – up close and personal! Whatever you needs are, please visit the Punta Gorda Chamber of Commerce and we’ll be only too happy to assist you in finding anything you need in our beautiful city. Welcome to Punta Gorda, Florida – the Jewel of Florida’s West Coast.